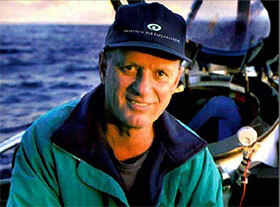 Sunday, August 27, 2017 6-8:00 p.m.
Robert Ballard is Founder and President of the Ocean Exploration Trust; Director of the Center for Ocean Exploration and Professor of Oceanography at the University of Rhode Island Graduate School of Oceanography. He is an Explorer-In-Residence at the National Geographic Society, Commissioner for the U.S. Commission on Ocean Policy, and a Senior Scientist Emeritus at the Woods Hole Oceanographic Institution. Dr. Mary A. Voytek is the Senior Scientist for Astrobiology in the Science Mission Directorate at NASA HQ. She is the founding Director of NExSS, The Nexus for Exoplanet System Science, a NASA research coordination network dedicated to the study of planetary habitability. Frieder Klein’s research focuses on seafloor hydrothermal systems. Trained as a petrologist and geochemist, Klein studies the interactions between rocks and aqueous solutions in a range of geological settings. Chris Glein is a research scientist at Southwest Research Institute, San Antonio. He received a BS in Chemistry from the University of Washington (2006), and a PhD in Geological Sciences from Arizona State University (2012). Chris German is a specialist in exploring deep oceans for sites of seafloor fluid flow and the unusual life that might be found there. Educated at the University of Cambridge in the UK, he first spent time at WHOI when he was a post-doctoral research fellow at MIT in the late 1980s.